Did you know that you can watch the shadows of Jupiter's four largest Moons pass across the face of the planet? All you need is a small telescope to see what Galileo Galilei witnessed through his crude optical device 400 years ago. On the morning of July 25, 1610, just before sunrise, Galileo turned the newly invented telescope for the first time on the bright face of Jupiter, the largest planet in our solar system. He was startled to see that Jupiter was not alone, but was accompanied by three tiny points of light to its left. The next time he observed Jupiter, it was joined by a fourth point of light. Galileo followed these points of light over the next few months, and it soon became apparent to him what he was seeing: four tiny Moons revolving in orbit around Jupiter, like a miniature solar system. If you have a small telescope yourself, you are actually better equipped than Galileo was to observe the dance of Jupiter's moons. His telescopes were of poor quality and low magnification compared to even the least expensive telescopes on the market today. Not only can you easily see the four Galilean moons as they move around Jupiter, but you can even see the shadows of the moons as they are cast on the cloud tops of Jupiter. 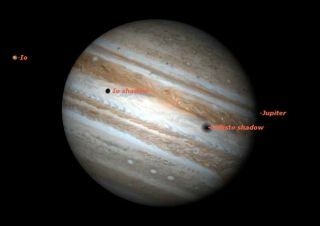 The shadows of Jupiter's moons are visible with telescopes as small as 90mm aperture with magnifications of 100x to 150x. As the moons of Jupiter move around the planet, they can show a number of interesting events: eclipses, transits, and occultations. When a moon passes in front of Jupiter, it is called a "transit." Usually the moon is visible only for the first few minutes and the last few minutes of the transit, which typically takes a couple of hours. That's because the moon is very small and blends into the background of the cloud tops, and vanishes from view. This is especially true for Io and Europa; Ganymede and Callisto are larger in diameter and darker in color, so can be seen in a 127 mm aperture telescope. The shadow of the moon, cast by the sun, can also be seen to transit across the cloud tops. Because the shadows are intensely black, they are much easier to see than the moons themselves. When a moon passes behind the planet, it can be occulted by the planet itself, or eclipsed by Jupiter's immense shadow. You can even watch a moon emerge from behind Jupiter, glow brightly for a few minutes, and then fade from sight as it enters Jupiter's shadow. All of these phenomena of Jupiter's moons are predicted in sources like the RASC Observer's Handbook and software like Starry Night. Just considering shadow transits (the most easily observable events) there are dozens every month, though not all occur when Jupiter is well placed in the sky. You'll notice that the rising times of Jupiter and the Sun are local times, while the events on Jupiter occur at exactly the same times all across the continent. Thus the show will unfold slightly differently depending on your exact location, but everyone in North America should get to see both shadows in transit simultaneously.